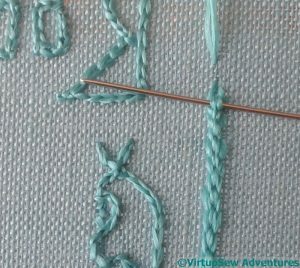 Oh no, not the Hungarian braided chainstitch… I love that one to bits and thought it was a ‘one-suits-all’ kind of stitch. Love to see how it turned out in the end! Oh dear, it sounds like it has been tough going! I hope the thoughts bring fruitful results! Can’t wait to see it. Oh I sympathise with you. I know this feeling well. I have a number of pieces that I sit and stare at trying to decide if I like them or not. 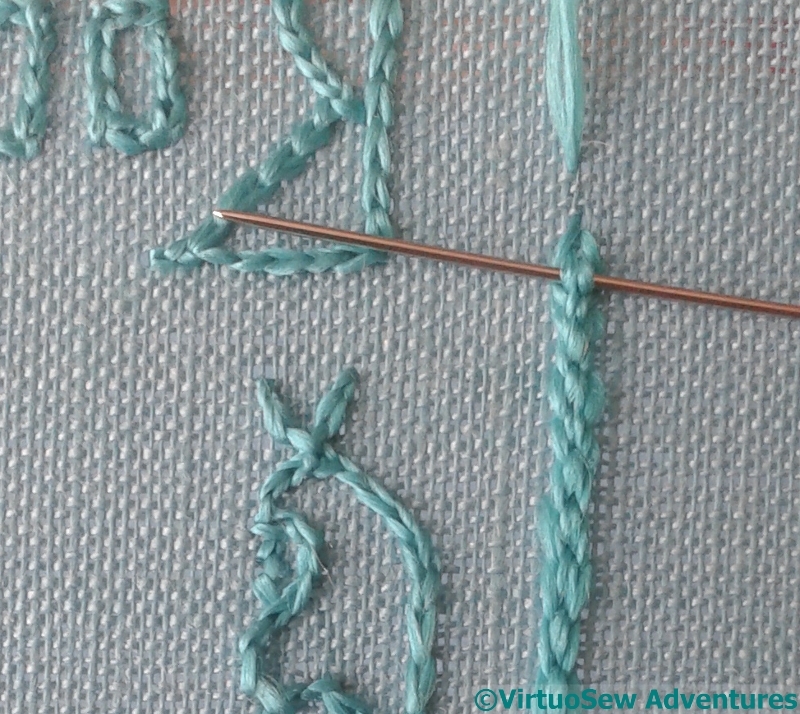 How frustrating it is when a favorite stitch does not work as one would have liked. Yes, I have many ‘stare-at’ pieces, and most of them look better the longer I stare, so I have learned to not be too quick with the scalpel if I find something I don’t like instantly. I guess the outline of the cartouche doesn’t need to be particularly bold, just neat and definite enough to look tidy. The head itself is the main attention-grabber. The wonderful HBC stitch is quite a heavy line. 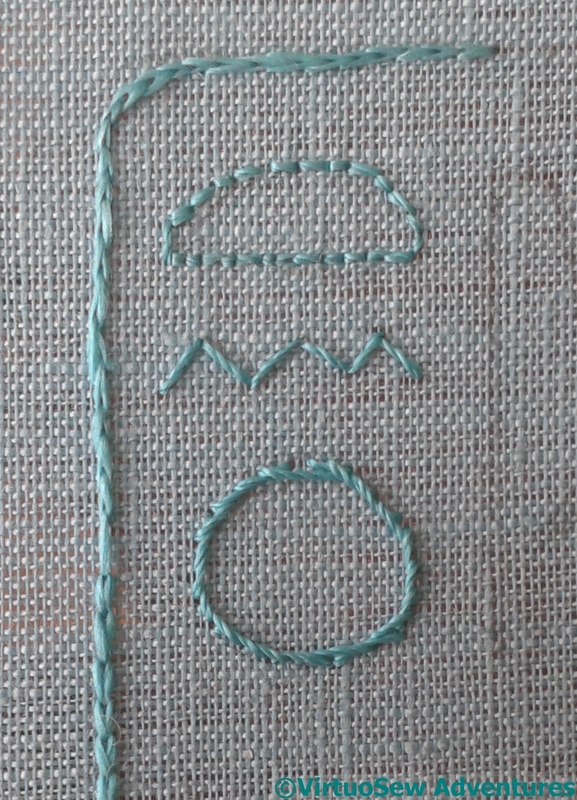 It’s good for getting a beefy line from a fine thread when chain stitch is too weedy. Having seen the original in the flesh (as it were), whatever you had put around the cartouche looked perfect to me – not too frail, not to heavy. It is a glorious piece of work. Photos do not do justice to how the silk and gold glows on the blue fabric. I think you can safely put the penknife away now. I would never have thought of using a penknife – I would probably slice through the fabric. I hope your ruminations have a successful outcome! I like the thicker thread, definitely. 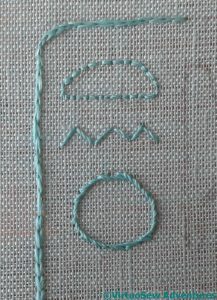 What if you used a thinner thread for the HBC stitch? Would that make it better to your eye? 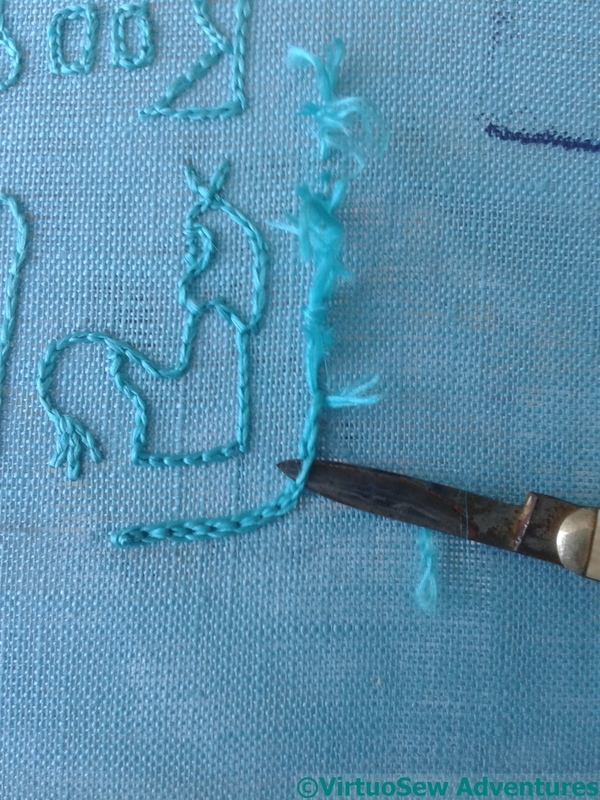 I like it, liked it before you took it out, but I think it may be heavier than other stitching on the piece. There was a sharp intake of breath here when I saw the photo with the penknife. 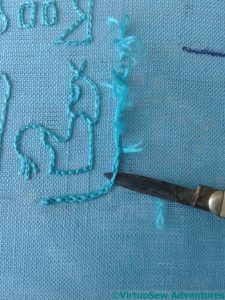 But when a line of stitches isn’t right, it just isn’t right.